Num dos blogs que visito regularmente a Tina mostrou o lindíssimo cartão que fez para participar neste desafio. Deixou-me o bichinho e num intervalo, peguei no que tinha cá em casa deste tipo de materiais (quase nada para dizer a verdade...) e fiz esta brincadeira. Obrigada Tina pela inspiração! I saw this beautiful card that Tina made to participate in this challenge. I got so inspired that I made a break, I took everything at home related with the theme ( almost nothing to tell the truth ...) and made this little card. Thank you Tina for the inspiration! Where is spring? All I see is snow! Great card. Awwwww....your card is so sweet and cute. Love the colors you chose on the white base. Snow is sooo beautiful! ...but Spring arrived with its birds, colours, smell... despite the rain or some cloudy days like today. Adorable! 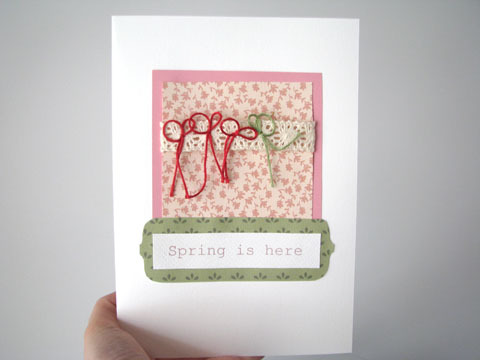 LOve the little string bows that remind me of butterflies...sweet, sweet card! So sweet...love the combination of lace and bows! Very nice with the vintage lace and little bows.